Germany... the land of thinkers and philosophers and the birthplace of Martin Luther. In 2017 Germany celebrated 500 years of Luther’s reformation. In Germany a church building can be found in almost every village and town. In many villages the local church is the largest and most beautiful building, but most of these churches are empty and unused. The registered Catholic and Protestants call themselves ‘Christians’, but the most are nominal Christians. Atheism, Esotericism and Materialism are the growing 'religions' in Germany. Germany is a country that was broken by the horrors of the second world war, but a country that found new life in the economic boom of the 1960’s and 70’s. It was that economic boom that has made Germany one of the strongest economic powers. Germany was long divided by the Cold War, split into eastern and western sectors by the allied forces. But it was reunited after the fall of the Berlin Wall in 1989. Germany has a land mass of 357.050 km² and a population of 82.5 million, of which 71.9 million hold German citizenship. This makes Germany one of the most densely populated countries in the world! In 1972, OM began working in Germany. Since 1982, the OM Germany home office is operating from an over 200-year-old former mill in the town of Mosbach in southwest Germany. The building operates as a Christian conference centre and accommodates the headquarter office of OM Ships. As a home office and sending field we send more than 80 new OMers or rejoining Ex-OMers to the OM world every year. Since 1993, we organize the annual TeenStreet Europe event. 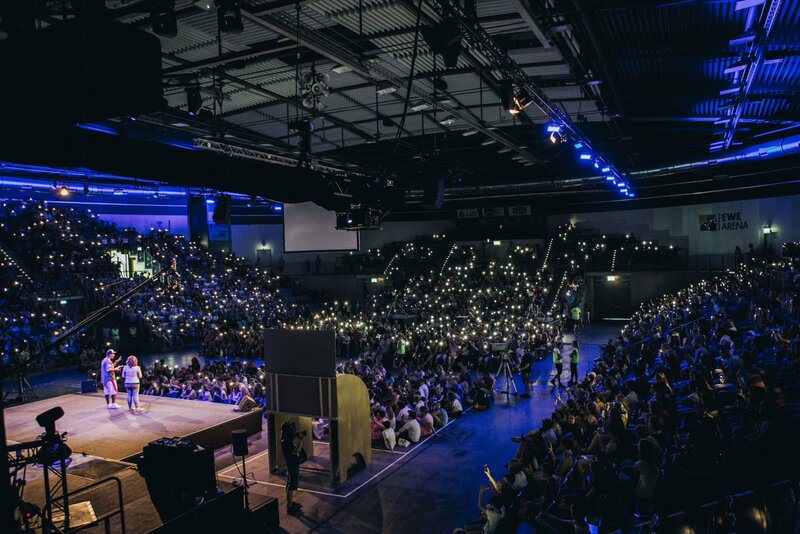 From the first congress with 56 participants, TeenStreet has grown into a major discipling and mobilizing opportunity, bringing together more than 4000 teenagers and youth workers from all over Europe. 2004 we started establishing three missional teams in Germany (the Xenos-Team in Heilbronn, the Team North in Hamburg and the Team Halle in Halle/Saale) and the Missions Discipleship Training MDT Love Europe. With our ministry teams we want to respond to the developments in Germany and reach out to people in our country. This challenge is far too big to be tackled by three small teams. We desire to set an example in missional ministry to inspire the churches in Germany to reach those out of reach, the least reached. OM Germany has three divisions. Together, their purpose is to mobilize churches and individual Christians in Germany into missions. We want to inspire, equip and train them for a sustainable missional life, both in Germany and worldwide. By taking care of the organizational, logistic and administrative tasks of OM Germany as a home office and conference center, this division makes the ministry of OM in Germany and beyond possible. This team mobilizes Christians in Germany to get involved in missions by praying, giving and going. This is done by communicating OM’s message in numerous ways and by giving opportunities for short-term campaigns. The missional teams and the Missions Discipleship Training seek to go fresh ways in reaching our generation for Christ – being both an inspiration to many and giving training opportunities to some. The Xenos Team (Greek: for stranger) works among refugees, asylum seekers and migrants in Heilbronn, a city in which 46.1% of the people have a migration background. The international café is very popular and a great place for the team to meet refugees from the city and surrounding region. The team offers practical help as well as opportunities to speak about spiritual needs and prayer. Regular worship meetings, discipleship groups and seekers classes are held in Farsi and Arabic. The teams aim is to see vibrant communities of Jesus followers among the migrants and to support them in the process of integration into Germany. The Team North in Hamburg moved in 2010 to a strongly secularized and socially troubled suburb of Hamburg. Together with another church and local Christians they plant a church, get in contact with people, help in social kids work and work with refugees. The Team Halle opened together with a local church the culture café “Lichthaus” (house of light). Besides the café there are additional concerts and other cultural events and exhibitions at the Lichthaus during the weekends. When guests become friends, they meet in small groups to deepen relationships and accompany them on their journey seeking God. Since 2017 the Team Halle is a missional church plant envisioning "36 small groups bringing Hope throughout the city of Halle" in the next 20 years. The MDT Love Europe is a 6-12 months program for young people between 18-30 years of age. Their vision is “to disciple and equip believers to take their part in God's transformation of lives and communities." This is achieved through cross-cultural community life, one-on-one mentoring, study-based knowledge and practical ministry experience in Europe. More information about MDT Love Europe here. With the many refugees, who have come to Germany since September 2015, OM Germany wants to invite and support German Christians and churches to help refugees. This happens with praying for the whole situation, making the ministry amongst refugees possible and being active in person. • Pray for the churches in Germany, especially as we celebrated the 500th reformation anniversary of Martin Luther. • Pray for our church planting ministries in Hamburg, Halle and Heilbronn. Pray for people to get to know Jesus through these ministries. • Pray that many German Christians get mobilized for mission, that they support workers and world mission and that they make Jesus known in the country. For stories on OM Germany’s ministry, take a look here. To contribute financially to OM Germany’s ministry, look here. See the job opportunities listed here. Contact us at: info.de@om.org or visit our website. Please join us in equipping the Church in Germany to help fulfill the Great Commission. Personality of the culture/people: Germans are usually direct and say what they think. They are well organized and structured, reliable and diligent. Germans love their cars, beer and soccer, especially their national team. Deutschland … das Land der Denker und Philosophen, die Geburtsstätte von Martin Luther und der Reformation. 2017 feierte Deutschland das 500-jährige Reformationsjubiläum. In Deutschland findet man in fast jedem Dorf oder Stadt ein Kirchengebäude, oft ist es sogar das schönste und höchste Gebäude. Aber die meisten dieser Kirchengebäude sind leer und ungenutzt. Die Katholiken und Protestanten nennen sich selbst ‚Christen‘, doch sind es meist nur Namenschristen. Atheismus, Esoterik und Materialismus sind die wachsenden ‚Religionen‘ Deutschlands. Deutschland ist das Land, das durch den Horror des Zweiten Weltkrieges zerbrach, aber durch den Wirtschaftsaufschwung der 1960er- und 1970er-Jahre zu neuem Leben fand. Dies hat Deutschland zu einer der stärksten Wirtschaftsmächte gemacht. Deutschland war jahrelang durch den Eisernen Vorhang in zwei Teile geteilt: West- und Ostdeutschland. Doch mit dem Fall der Berliner Mauer 1989 feierte das Land seine Wiedervereinigung. Deutschland ist 357 050 km² groß und hat eine Bevölkerung von 82,5 Millionen, von denen 71,9 Millionen die deutsche Staatsbürgerschaft haben. Das macht Deutschland zu einem der am dichtesten besiedelten Länder der Welt. 1972 begann die OM-Arbeit in Deutschland. Seit 1982 ist das Heimatbüro von OM Deutschland in einer über 200 Jahre alten Mühle in Mosbach, Süddeutschland. Die Mühle dient auch als Konferenzzentrum und beherbergt das Koordinationsbüro der OM-Schiffsarbeit. Als Heimatbüro und sendendes Feld schicken wir jedes Jahr gut 80 neue OM-Mitarbeiter (oder ehemalige OM-Mitarbeiter, die wieder einsteigen) in die OM-Welt. Seit 1993 organisieren wir jedes Jahr TeenStreet Europa. Vom ersten Kongress mit 56 Teilnehmern ist TeenStreet zu einer bedeutenden Jüngerschafts- und Mobilisierungs-Möglichkeit gewachsen, die über 4000 Teenager und Jugendarbeiter aus ganz Europa zusammenbringt. 2004 begannen wir mit dem Aufbau von drei missionalen Teams in Deutschland (das Xenos-Team in Heilbronn, das Team Nord in Hamburg und das Team Halle in Halle/Saale) sowie das Missions- und Jüngerschaftsprogramm MDT Love Europe. Mit diesen Teams wollen wir auf die Entwicklungen in Deutschland reagieren und die Menschen in unserem Land erreichen. Diese Herausforderung ist jedoch für drei kleine Teams viel zu groß. Unser Wunsch ist es, dass wir ein Beispiel geben können, wie missionales Leben aussehen kann, um die Gemeinden in Deutschland zu inspirieren, die am wenigsten Erreichten zu erreichen. OM Deutschland hat drei Bereiche. Das gemeinsame Ziel ist es, Gemeinden zu mobilisieren und Christen in Deutschland in die Mission zu senden. Wir wollen sie für ein nachhaltiges missionales Leben – in Deutschland und weltweit – inspirieren, ausrüsten und schulen. Dieser Bereich macht durch organisatorische, logistische und administrative Aufgaben die Arbeit des Heimatbüros und Gästebetriebs von OM Deutschland – sowie die allgemeine Arbeit von OM Deutschland und darüber hinaus – möglich. Dieser Bereich mobilisiert Christen in Deutschland für Mission, zum Beten, Geben und Gehen, indem die Botschaft von OM auf unterschiedliche Weise kommuniziert wird und Möglichkeiten für Kurzeinsätze gegeben werden. Das Xenos-Team (griechisch: Fremder) arbeitet mit Flüchtlingen, Asylbewerbern und Migranten in Heilbronn, einer Stadt, in der 46,1 Prozent der Einwohner einen Migrationshintergrund haben. Das internationale Xenos-Café ist ein gut besuchter Treffpunkt und gibt dem Team Kontakt zu Flüchtlingen aus der Stadt und der umliegenden Region. Neben praktischer Hilfe sucht das Team auch das Gespräch über den Glauben und bietet Gebet an. In Farsi und Arabisch gibt es Gottesdienste und Jüngerschaftsgruppen sowie Kurse für Flüchtlinge, die Jesus kennenlernen möchten. Das Team verfolgt das Ziel, dynamische Gemeinschaften von Jesus-Nachfolgern unter den Migranten zu gründen und sie bei der Integration zu unterstützen. Das Team Nord zog 2010 in einen stark säkularen, sozial schwachen Teil von Hamburg. Gemeinsam mit einer Gemeindegründungsinitiative haben sie dort eine Gemeinde gegründet, sind mit Menschen in Kontakt und arbeiten mit Kindern und Flüchtlingen. Das MDT Love Europe ist ein sechs- bis zwölfmonatiges Programm für junge Christen zwischen 18 und 30 Jahren. Die Vision ist es, „junge Erwachsene zu Jüngern zu machen und sie auszurüsten, Leben zu verändern und Gesellschaft zu gestalten.“ Dies wird durch interkulturelles Zusammenleben, Eins-zu-Eins-Mentoring, Training und Einsätze in ganz Europa erreicht. Mehr Informationen zum MDT Love Europe gibt es hier. Mit den vielen Flüchtlingen, die seit 2015 nach Deutschland gekommen sind, möchte OM Deutschland Christen und Gemeinden im Land dazu einladen, Flüchtlinge zu unterstützen. Dies geschieht durch Gebet für die Situation und indem durch den aktiven Einsatz die Arbeit unter Flüchtlingen möglich gemacht wird. • Bete für die Gemeinden in Deutschland, besonders nachdem wir 2017 das 500-jähringe Reformationsjubiläum gefeiert haben. • Bete für unsere Gemeindegründungsprojekte in Hamburg, Halle und Heilbronn. Bete, dass Menschen durch diese Teams zum Glauben an Jesus kommen und ihm nachfolgen. • Bete, dass viele deutsche Christen sich für Mission einsetzten, dass sie Mitarbeiter und die weltweite Missionsarbeit unterstützen und dass sie Jesus in ihrem Land bekannt machen. Geschichten über die Arbeit von OM Deutschland (auf Englisch und/oder Deutsch) findest du hier. Du kannst die Arbeit von OM Deutschland hier finanziell unterstützen. Hier findest du Möglichkeiten zur Mitarbeit. Bitte kontaktiere uns oder besuche unsere Website. Werde Teil unserer Arbeit und hilf uns dabei, den Missionsauftrag in Deutschland zu erfüllen. Wirtschaft: größte Wirtschaftsmacht in Europa, viertgrößte Wirtschaftsmacht der Welt. Persönlichkeit der Kultur/Menschen: Deutsche sind direkt und sagen, was sie denken. Sie sind gut organisiert und strukturiert, zuverlässig und fleißig. Deutsche lieben ihre Autos, ihr Bier und Fußball, ganz besonders ihre Nationalmannschaft.